Quickly generate a PRODAS Model from a bitmap picture of a projectile. 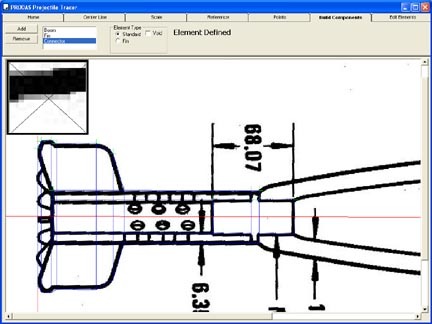 Whether the bitmap came from the web, a scanned image from "Jane's" or a digital photograph of a sectioned projectile, using this tool you can quickly build a PRODAS model that can be used in any other PRODAS analysis. We are in the midst of building a tutorial to illustrate this in use and will post it as soon as it is available. Please keep checking back. Select vertice pairs, this will build the elements. If you know the real mass properties, you only need to do the exterior contours. With a single click, the PRODAS model is generated. Using the standard PRODAS editor, modify the generated model definingaero properties such as Ogive, Boattail and Boom. Now you can run trajectories, produce firing tables or even run system effectiveness analysis ! It is entirely possible to generate a complex PRODAS model from a bitmap in under five minutes, even including fins.